Often crowded on holidays, this Key West National Wildlife Refuge island lies 14 miles west of Key West. A narrow beach on the west and southwest sides along a protected anchorage extends to the northern tip of the island. 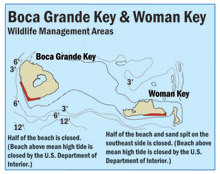 Half of the beach is closed to protect wildlife. Many species of birds use this area, including some that are listed as federally endangered and threatened.